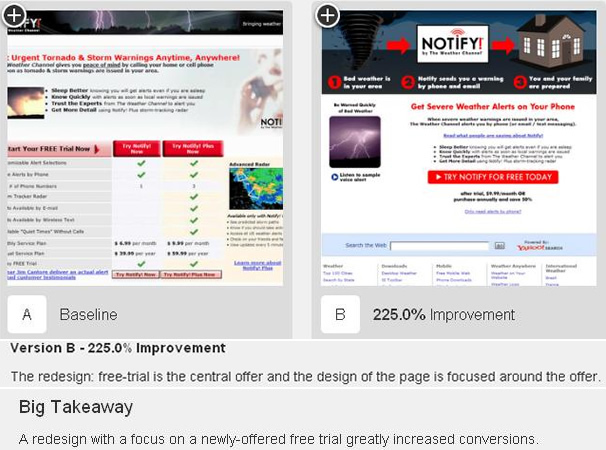 A/B Tests: What Should You Be Testing? One of the great things about testing online is the fact that almost anything on a web page or in an email campaign can be tested. While this creates a lot of options and flexibility, it can also make the decision of what to test a difficult one. Much like a test from your high school science class, once your goal is defined, you must then determine how you will achieve it, define the control variable, state your hypothesis, and run the test. We are going to take a look at some popular elements to test, and ways to go about doing it (by no means the only ways!). One of the most important elements on a page, especially when attempting to sell a product or service is the headline. A good headline needs to capture the attention of users and draw them into your body copy. Compare your product or service with something site users are familiar with. Every web page should have at least one clear to action encouraging site visitors to complete a desired action. If not, you’re missing out on a lot of opportunity as users may never fully ever understand what they are suppose to do once they get to your site. While calls to action such as ‘Buy Now’ or ‘Subscribe’ are very common, there are still a lot of factors to test, which could lead to much improved conversion rates. Size and style of your call to action: is it flat, 3D, or have a shadow outline? Buying is an emotional process. Images and colors both contribute to the perception of your site and have a direct influence on user’s feelings and mood, even if they don’t realize it, which can be a positive or negative depending on your design. For example, the color red is often associated with errors or warnings and could carry negative connotations. There is also data to suggest people are more likely to respond to images of people more than simple graphics. Each word on your site presents a new chance to connect with a visitor and guide them to the desired thought or action you have for them. It’s important to use an active writing voice, avoid jargon, sell benefits more than features, and be clear. Next PostBlack Book Sessions. What Inspires You?